I don’t know about you but I like to celebrate Halloween all month long! After all, the cool, crisp October air is perfect for apple picking, picking out pumpkins, corn mazes and other fall festivities. What better way to celebration with a sweatshirt to keep you warm like these Halloween sweatshirts for adults. 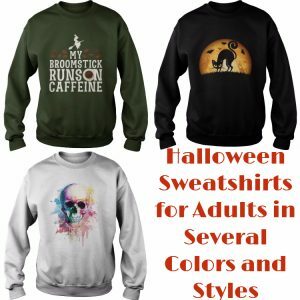 This entry was posted in Apparel and tagged Halloween sweatshirt, Halloween sweatshirts adults, Halloween sweatshirts for adults, Halloween sweatshirts for men, Halloween sweatshirts for women on October 1, 2017 by Halloween Inspired.